FT Gremlin Frame by Andres Lu by SP0NZ is licensed under the Creative Commons - Attribution license. Flite Test created a brushless micro quad that’s all about the fun and creative experience. That’s why they designed the Gremlin to be just as fun to build as it is to fly. It’s a swappable style design that can be easily modified to express your own creativity. 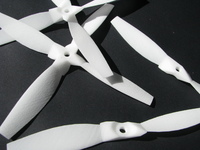 Flite Test sells Gremlin frames made from 3/32 (.094) inch thick Delrin or Carbon. The frames are incredibly durable and work great for indoor and outdoor flying, making the Gremlin an affordable option for those learning to fly quads and for seasoned pilots as well. Now you can print your own frames using the same shape files used by Flite Test to cut the delrin and carbon frames. We’ll be releasing more frame designs in the future as well as free plans to go along with them. And in the swappable spirit, we want to see what YOU create! Share your ideas for Gremlin frames on our YouTube channel, Facebook page or in an article, and it could become a Gremlin community release on the Flite Test Store! These models are created from the original Flite Test source files. Say thanks by giving SP0NZ a tip and help them continue to share amazing Things with the Thingiverse community.